The Gowanus Lounge: Are There Toxics Under This Gowanus Playground? Are There Toxics Under This Gowanus Playground? Of all the environmentally questionable sites Gowanus and Brooklyn, one that should raise some eyebrows is the Thomas Greene Playground on Third Avenue at Douglass Street. The park, which is also the site of a public swimming pool, was once the site of a manufactured gas plant, the Fulton Municipal Gas Company. It operated from 1879 to 1943. If you're wondering why we keep beating the drum of MGPs as they're called, it's because they can leave behind an especially nasty mix of toxins. (The process of producing gas from coal was not a pretty one and Brooklyn had an inordinate number of these facilities. There were three in Gowanus alone, and the current debate over the site known as Public Place is about how to clean the massive quantity of toxins left behind by an MGP.) The plants left a toxic muck that included coal tar, which also has a habit of migrating a great distance underground. The playground site was included in the Gowanus Canal Community Development Corporation's survey of neighborhood sites with toxic contamination issues. 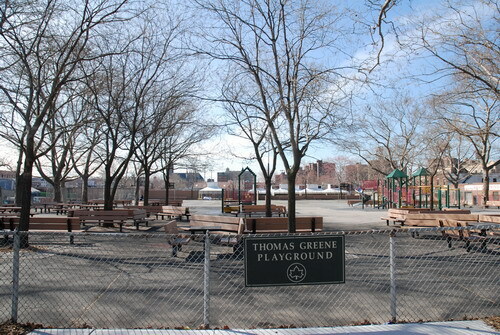 The Thomas Greene Playground serves residents of the nearby Gowanus Houses, which overlays issues of class and race. The bulkhead along a portion of this former MGP site has almost completely failed, offering similar risks to the canal as the two sites mentioned above. In addition, the two properties that lie north of the former MGP site were former coal yards, which may have deposited coal tars into the soil and groundwater. Currently auto garages and a crowded truck storage facility occupy the site along the waterfront...It is also important to note the Thomas Greene Playground was once part of the former MGP site, although the consultant does not have any information regarding potential community exposure. The GCCDC should work with the New York City Department of Parks and Recreation to determine if any community health risks do exist at this playground. One would think the Parks Department would have already endeavored to determine "if any community health risks" exist at the playground. Another consultant's report that Gowanus Lounge obtained notes that when the plant was shut, all the coal tars "were reportedly removed" from the site. However, the report lists as "unknown" all of the threats the site might present from risk of direct contact with toxins to exposure to hazardous substances. While this report downplays the risk compared to sites such as Public Place where there is a significant amount of known contamination, it also implies that children are playing on a property where there is an unknown risk. One would think the health of the children using the park would be important enough that definitive answers would be available and that the site would be examined using modern technology so that the exact risk or lack thereof would be known. At a minimum, information about the site's history could be more widely available so that the parents in the Gowanus Houses and others who bring their children there would be aware of its past. Now, when you go to Gasworks, there are signs everywhere warning you that this is reclaimed land and that you should make sure children don't eat the dirt (I'm paraphrasing here). Some interesting questions in that article. Most if not all of historic waterfront Brooklyn is toxic. What's That Thing on Top?